A reader at my web site made a claim that I and other readers can't substantiate. What do you think about it? Does anyone remember an incident like this at the Tulsa Speedway? In the late 1960s or early 1970s, I don't remember what year, I and others, even if they didn't realize it, witnessed a murder at The Tulsa Speedway at the fairgrounds. I have been a viewer of the Tulsa TV website. It is very interesting and I'm not even from Tulsa. Every once and a while racing is the topic over there. http://guestbooks.pathfinder.gr/read/tulsatv The link will let you read the responses the story. An asswhipping is way different than killing someone. Had that happened just as the writer claimed in the other website, things would have been a lot different today. The lesson I keep learning is that my "impressions" from 30+ years ago often fail to match up to reality. I have not heard of anyone making this claim. Also,just because the guy supposedly had an ex "AJ Foyt sprinter", does NOT mean the guy was fast because of it. Even Smokey Yunick stated that as long as the cars were hard to drive, AJ had an upper hand. Only after the cars got to handling easier did it become harder for Foyt to dominate. Can't recall any murderous drivers, but I can recall several misguided fans who like to cause trouble due to "catching the drift" in the wrong manner. My guess is maybe something like that happened? But nobody probably died? Stories tend to get stretched over the years. I don't know since the web site started how many viewers have e-mailed insisting drivers died in 74 Hutch fire. The original post and follow-ups are now archived at http://tulsatvmemories.com/gb113008.html To save you the trouble of going there and having to pick out the relevant items, here they all are in time order. I remember that Mario Andretti was there and some other Indy types whose names I can't remember. Assisting me (happily) in the announce tower was fellow Texan, Johnny Rutherford. That happy circumstance was because he had broken his arm and couldn't drive. Comments: I can't let the story that (original writer) wrote go on without contesting it. I'm not sure I ever did or ever will know any driver that would have put a hit on anyone at the Tulsa Speedway. The story is so full of holes that this writer couldn't make up his mind whether the driver was leading or following the pack. TTM Webmaster: Ron Lux' crash was on turn 4, according to Lee Woodward. Are you saying it was his crash that you saw? Comments: (To original writer): If in fact there was a death of the sort you are accusing, then certainly you would know the name of the deceased. If you could provide that, then it might lend credence to your story. However, until that is provided, your story will always be in question. If not, then there could still be charges filed if your story is found to have any substance. TTM Webmaster: I must agree with Tom. With no name and no corroboration, this dire interpretation of a 40-years-distant event has to be regarded skeptically. Another reason for me to question the guy that wrote this is he keeps talking about multiple heats for each driver in ONE night. This guy is not striking me as a knowledgeable fan. a death may have occurred, but killing someone simply because of being fast in such a short amount of time and then rejoicing over it,is not a mindset I've been picking up on my radar. Never have. In the book The American Dirt Track Racer by Joe Scalzo "Ron Lux got in the way of himself and tried something that didn't work on Arnie Knepper. Arnie escaped, but Ron took a fatal flip". What does that mean tried something that didn't work on Arnie Knepper? Was Ron an outsider trying to run with USAC? I saw that, too, but the book portrays the event as occurring at Olympic Stadium in Kansas City, so I wonder how accurate the account is. The following paragraph says the next stop was Tulsa, where supposedly nothing happened. Here is a link to the excerpt at Google Books. I have been reading this message since it was posted. I ran at Olympic Stadium every Sunday night & any other racing night & Ron Lux did not run there from 1961 until his death. 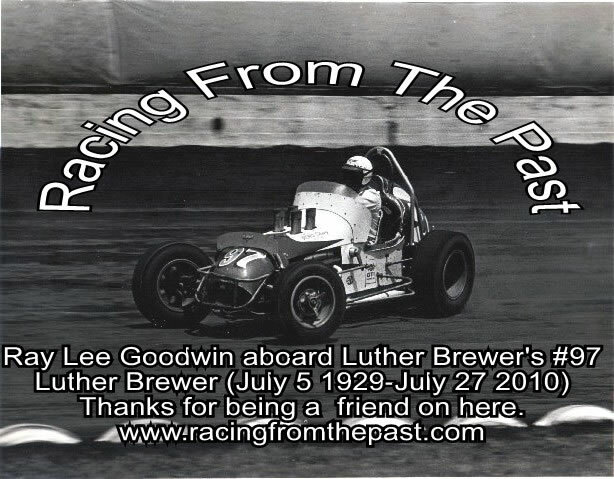 He was killed in Tulsa during a USAC sprint race in 1966. I think it was in 1966, the same year Jud Larson, Red Regel Don Branson & several other USAC drivers were killed in sprint cars. Brian26,... I agree with you on this one. I have been around racing since 1948 as a spectator & involved from 1961 through mid 80s. Ron Lux was killed at Tulsa 3/8 mile track track July 16, 1966 in a USAC sprint car. He was 26 years old. The only incident I can ever remember that happened in Tulsa, and it was in the early sixties, was when Harvey Shane ran Al Lemmons into the fence, flipping him several times. Shane was banned from Tulsa after that. Al's car landed on top of the catch fence. Go to Danley Clow's site and click on Al Lemmons and he has a couple of pictures of the aftermath. Could this be the incident the original poster is talking about? Al wasn't killed, of course, but he was out for a while. That was the first time I knew the blood rushed to your head in a flip and gave you black eyes. As for the Ron Lux deal...Do any of you guys remember that Arnie Knepper was involved in a lot of incidents? I don't know why that keeps sticking in my mind. One more thing...I've been to hundreds of races, and the Lemmons/Shane incident was the ONLY time I can ever remember one driver trying to hurt another intentionally. Seems plausible, but the poster is insistent that it must have been in the late 1960s / early 1970s. I thought Danley Clow's name sounded familiar. He has triplet daughters and a son I remember from my grade school days. And he has a photo of the Greer Stereo Tape Center in Tulsa that will be of interest on my site. Johnny Rutherford, mentioned above by Lee Woodward, is also pictured. I have heard that story Mike. I should have saved the hundreds (if not thousands) of e-mails but with computers crashing over the years most were lost. I believe I have had the story e-mailed at least 3 times from Tulsa viewers. Arnie Knepper ran a sprint car at the IMCA races at the Sedalia, MO fair in 67, 68 or 69 and during a heat race the RF wheel came off going down the back stretch on the 1/2 mile track. All cars were pitting off the north end of the race track with an exit near turn 3 & entrance at turn 4. Arnies wheel continied straight ahead, bounced over the highway guard rail in the north end & hit a Missouri State Trooper car in the left rear door. It did a lot of damage since the car was sitting crossway to the track. The trooper was nowhere to be seen so Arnie put the wheel back on the car, loaded up and left immediately. I saw this happen. Just got interested and googled Ron Lux. There is a Motorsports Memorial site that gives information on lots of guys. Ron Lux raced not only under his name, but two psyudonyms and often with a borrowed USAC license. He was mostly an IMCA driver and evidently in the day USAC frowned on their drivers racing with other organizations. I bet you a dollar to a donut this is the incident the original poster is talking about. Here's the Motorsports Memorial item on Ron Lux. But I didn't see mention of a specific incident. Think I'll hold on to my donut! I'm betting you're right. I ran my 1 st car at Tulsa in 1961. It was probavly in June. That night, a sprint with a roll cage wrecked on the back stretch and the supposedly the seat belt was not latched or broke & the driver was killed. That is the word circulated that night. Most of Tulsa cars at that time were sprints converted to what they advertised as, "California Super Modified". Jack Belk won in Al Weilands #37 & Bud Hatch ran 2 nd in his own #87.